Book Corner: Interview with Tony Riches – History… the interesting bits! 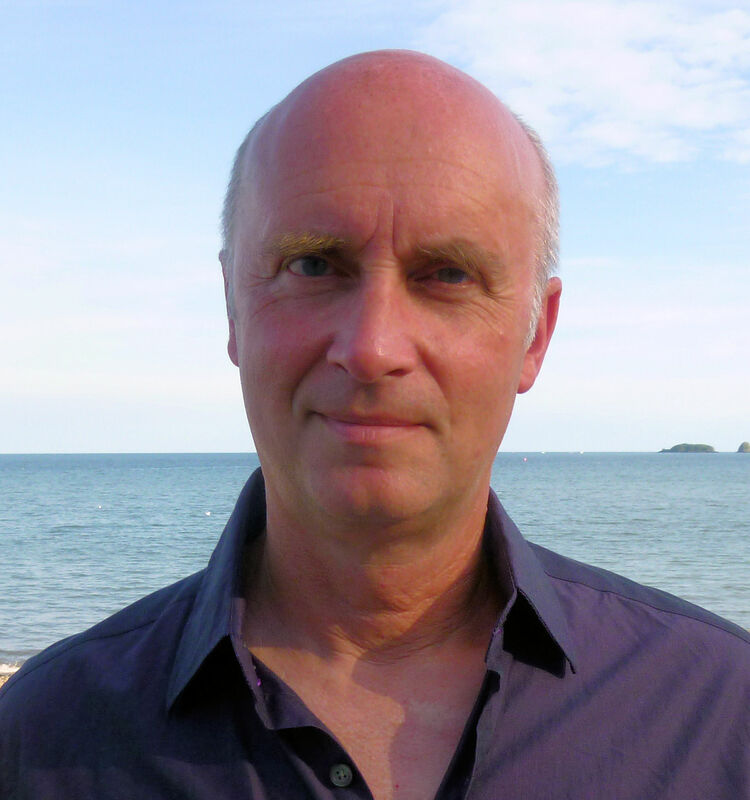 This week I’m talking to best-selling historical fiction author Tony Riches who lives in Pembrokeshire, one of the most unspoilt areas of the UK. Hi Tony, thanks for agreeing to be a guest interviewee on my blog, History…the Interesting Bits. Hi Sharon I’d like to start by congratulating you on a great blog – it’s good to see a balance of well researched history and historical fiction. Thank you Tony, that’s lovely to hear. So, what made you become a writer? Who are your major writing influences? I read widely, so it is hard to single out influences, although some of my favourites are C.J. Sansom (I’ve just finished reading his impressive book Lamentation, about Queen Katherine Parr), as well as Anne O’Brien and Conn Iggulden. Most novels tend to look at the Wars of the Roses from the Yorkist side, what made you choose to tell the story from the Tudor point of view? I was born within sight of Pembroke Castle, so feel a special connection with Henry Tudor, who was born there. Everyone knows about King Henry VIII and his daughter, Queen Elizabeth Ist – but I was surprised to discover there were no books about Owen Tudor, the Welsh servant who married a queen and founded the Tudor dynasty. I discovered several accounts of the life of Henry Tudor (who later became King Henry VII) but there were no novels that brought his own story to life. 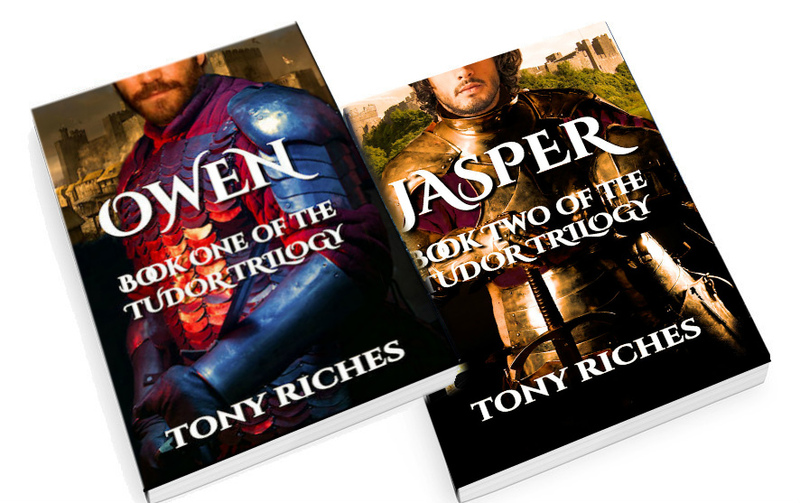 The idea for the Tudor Trilogy occurred to me when I realised Henry Tudor could be born in book one, ‘come of age’ with the help of Owen’s son, Jasper Tudor, in book two, and rule England in book three, so there would be plenty of scope to explore his life and times. If someone said they wanted to make a film of your books, who would you pick to play Owen, Edmund and Jasper? How long do you spend researching a novel before you start writing? What comes first, your storyline or your research? I have to decide where to start the storyline, then I start the research notes. For example, in OWEN I decided to begin with his first meeting with Queen Catherine of Valois, as little is really known about his life before then and I could easily work it in later. You’ve also written a novel about Warwick, the Kingmaker, so which are you, Yorkist, Lancastrian – or on the fence? 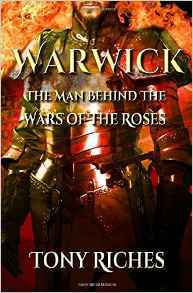 Richard Neville, ‘Warwick the Kingmaker’ was a fascinating character to write about, as I explored his motivation for changing sides. Personally, like Jasper Tudor – and his nephew Henry, I would like nothing more than to reconcile the houses of Lancaster and York. I have great sympathy for Edward of York, and have even tried to give his younger brother Richard the benefit of the doubt. Owen is told in the first person. It works really well – makes the story more personal for the reader. What made you write it in that way? I’d already written the first two chapters when I read Wolf Hall, by Hilary Mantel, and was struck by the power of her use of the present-tense. It was a huge risk to re-write it in the first person present-tense but I enjoyed the challenge. How do you organise your writing day? I’ve learnt to ‘deal with’ social media early in the morning to prevent it distracting me from writing. My ‘system’ is to aim for twenty-five chapters of about four thousand words, to arrive at a completed first draft for editing of about a hundred thousand. I keep track of my daily word count on a simple Excel spreadsheet, which allows me to see how well I’m doing at a glance. There is nothing better than having feedback from a reader who says they’ve really enjoyed one of my books. I’d like to think in some small way I’ve also helped readers understand the rise of the Tudors a little better, and it’s my ambition to present a more balanced view of the often overlooked King Henry VII. I should know better by now but I must admit that a harsh comment in a review can trouble me for days. One reviewer recently pointed out that I’d failed to explain the reason for the Wars of The Roses! How long does it take to do a project from start to finish? Do you write one book at a time, or have several on the go at once? I’m happy to produce one new book a year. I enjoy sailing and kayaking, so I usually begin writing at the end of the season in October and aim to send a first draft to my editor by Easter the following year. The process is so intense I don’t think I could manage to juggle two books at once. Who are your favourite personalities from history? Is there anyone you would particularly like to write about, but haven’t yet? It would have to be Jasper Tudor, who put his loyalty to Henry Tudor and Margaret Beaufort before everything else. As for those I haven’t written about yet, there are some fascinating members of the court of Henry VIII I’ve already ‘penciled in’ for potential future novels. You’ve written about the Wars of the Roses and the Romans, what other historical periods would you like to write about? I’d like to slowly make my way towards the Elizabethan period, as I was looking at an original portrait of Queen Elizabeth 1st recently and saw the knowing look in her eye. There are plenty of books about Elizabeth but still plenty of scope to explore her life and times. Do you ever get writer’s block? If so, how do you get around it? No, I suffer from the opposite, which is waking up with my characters voices telling me so much I can hardly write it all down quickly enough. I keep my laptop by the side of the bed now, and have been known to write a whole chapter before breakfast. Do you find social media – such as Facebook and Twitter – a benefit or a hindrance? Twitter is a great way to build an international readership and has enabled me to have best sellers in the US and Australia – something which earlier writers would only have been able to dream of. As a consequence, I’ve invested less time in Facebook, although there are some great groups there which I follow and contribute to when I can. We have had Owen and Jasper, so what will be the last book of the Tudor trilogy? I’m busy with the research for HENRY – Book Three of the Tudor Trilogy now. I’ve just read Alison Weir’s excellent new book about Katherine of Aragon and was disappointed to see Henry portrayed as more than a little sinister and insensitive, so it looks like it’s up to me to present an alternative point of view. What is your next project, once The Tudors is complete? I’m looking forward to entering the court of Henry Tudor’s tyrannical son – through the eyes of someone who knows him particularly well…. For more information about Tony’s books please visit his popular blog, The Writing Desk and his WordPress website and find him on Facebook and Twitter @tonyriches. Thank you very much, Tony Riches, for that marvellous insight into the life of a writer. Thoroughly entertaining. Cool interview, I’ll be getting the Tudor trilogy after I’m finished reading my next 2 books! Enjoyed the first two Tudor books very much. I have had a sneaking sympathy for these two since I first learned about them, and Mr Riches presented them in an informative and engaging manner. Looking forward to Henry. A great interview Sharon. I will be buying these books and look forward to reading about Owen and Jasper. Pingback: Book Corner: Henry by Tony Riches – History… the interesting bits! Pingback: Heroines of the Medieval World – History… the interesting bits! Pingback: Guest Post: Mary – Tudor Princess by Tony Riches – History… the interesting bits! Pingback: Book Corner: Mary, Tudor Princes by Tony Riches – History… the interesting bits! Pingback: Guest Post by Tony Riches – Charles Brandon’s Marriage to Catherine Willoughby – History… the interesting bits!